Morphological collection - IZW Leibniz Institute for Zoo and Wildlife Research in the Forschungsverbund Berlin e. V.
The research and reference collection of skulls and skeletal parts and of formalin-preserved organs has been building up since the founding of the IZW in its modern form in 1992. Most specimens were acquired during routine post mortem examinations conducted by the pathologists of the IZW and deep-frozen for future processing. Several of them provided the basis for scientific investigations in the field of evolutionary morphology and were dissected in detail by application of the in-water-method and documented by extensive photography. 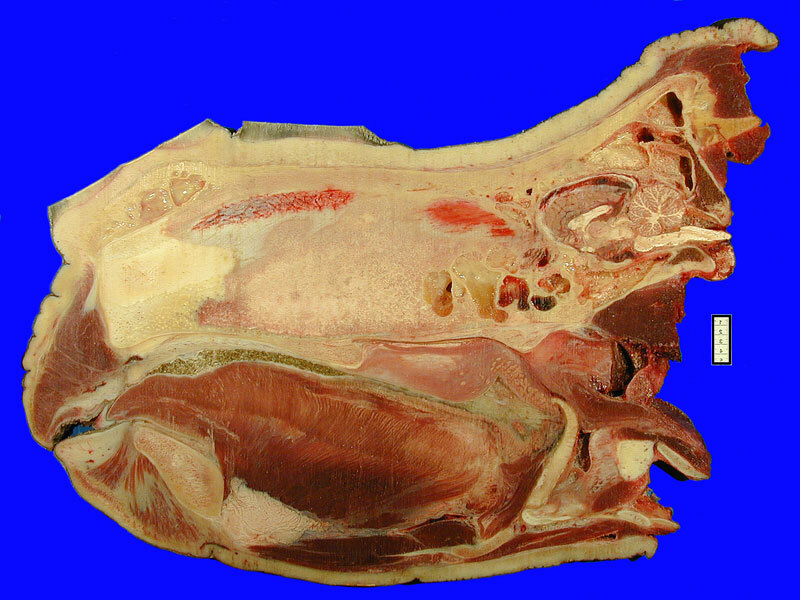 In the course of dissection, the removed soft tissue parts and organs were transferred into formalin and stored for future reference or histological procedures. Selected specimens were scanned, using the computer tomography scanner of the IZW, prior to dissection and analysed in virtual sections and 3D reconstructions. Subsequently, the dissected and non-dissected specimens were subjected to skeletonisation in the mazeration hall of the IZW. After having passed a time-consuming cleaning and assembly process, the skull and skeletal parts are entered into the display cabinets in the exhibition area on the first floor of the IZW. Actual stock comprises about 220 species. Links to the pathological anatomical reference collection (PARS) exist as individuals may be represented not only by skeletal parts but also by tissue samples and post mortem diagnosis. Research projects in evolutionary morphology at the IZW attempt to integrate comparative anatomical, physiological and behavioural results. Examples are the work on the rutting calls of male saiga (Saiga tatarica tatarica), which are produced via the nose, the work on the descended and highly mobile larynx in rutting male Mongolian gazelle (Procapra gutturosa) and goitered gazelle (Gazella subgutturosa) and the work on the vocal anatomy and vocal behaviour of Iberian red deer stags (Cervus elaphus hispanicus) (Frey et al. 2007, 2008a, b, 2011, 2012). Graphic reconstructions by hand, virtual 3D reconstructions on the basis of computed tomographic (CT) scans, video single frame analysis, digital synthetic reconstructions and the analysis of original acoustic recordings are integrated to achieve a comprehensive synthesis of results. A major requisite in this respect is a good collection of carefully preserved skeletal specimens. 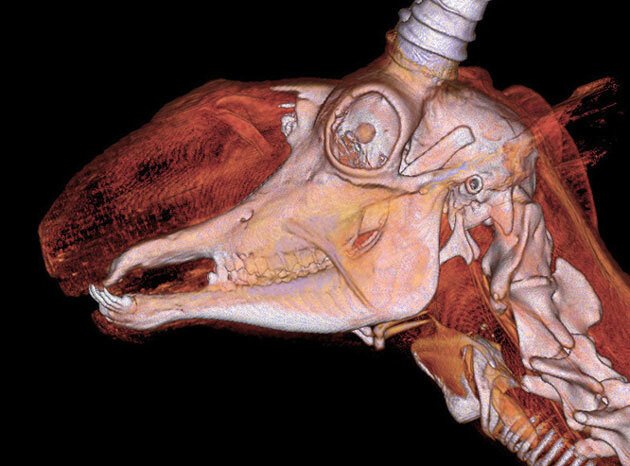 In addition to their use in research, specimens, photos, graphic reconstructions and CT-based virtual 3D reconstructions of specimens are regularly used for academic teaching. Last, but not least, the IZW morphological collection is a documentation of one aspect of biodiversity among vertebrates and it lively demonstrates how a basic pattern can become multiply transformed in the course of evolution. Frey R, Volodin I, Volodina E, Carranza J, Torres J (2012) Vocal anatomy, tongue protrusion behaviour and the acoustics of rutting roars in free-ranging Iberian red deer stags (Cervus elaphus hispanicus). J Anat 220: 271-292. 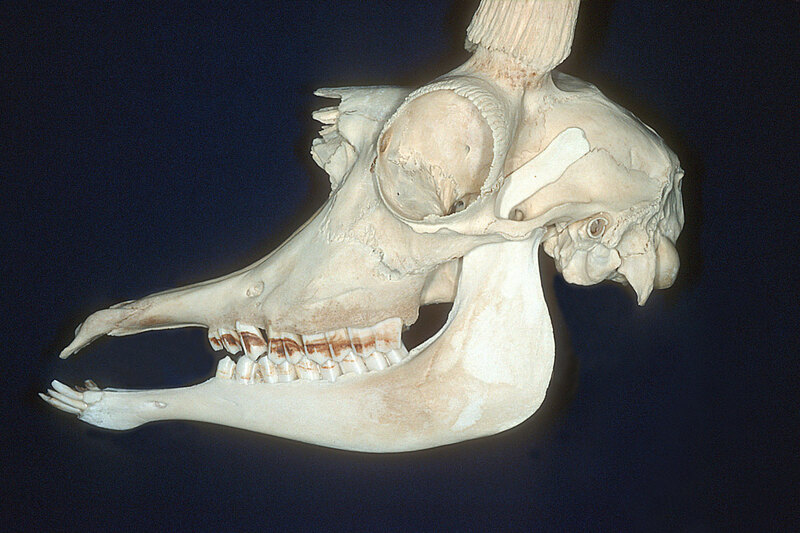 Frey R, Volodin I, Volodina E, Soldatova NV, Juldaschev ET (2011) Descended and mobile larynx, vocal tract elongation and rutting roars in male goitred gazelles (Gazella subgutturosa Güldenstaedt, 1780). J Anat 218: 566-585. Frey R, Gebler A, Olson KA, Odonkhuu D, Fritsch G, Batsaikhan N, Stuermer IW (2008) Head anatomy of male and female Mongolian gazelle – a striking example of sexual dimorphism. In: Endo H, Frey R (eds), Anatomical Imaging – towards a new morphology. Tokyo, Springer: 1-13. Frey R, Gebler A, Olson KA, Odonkhuu D, Fritsch G, Batsaikhan N, Stuermer IW (2008) Mobile Larynx in Mongolian Gazelle - Retraction of the larynx during rutting barks in male Mongolian gazelle (Procapra gutturosa Pallas, 1777). J Morphol 269, 1223-1237. Frey R, Volodin I, Volodina E (2007) A nose that roars: anatomical specializations and behavioural features of rutting male saiga. J Anat 211, 717-736.